LEDGlow's Tailgate Light Bar Y-Splitter Harness allows you to easily connect your tailgate light bar to your truck's flat 4 pin port, as well as connecting your trailer lights on the same harness for power. 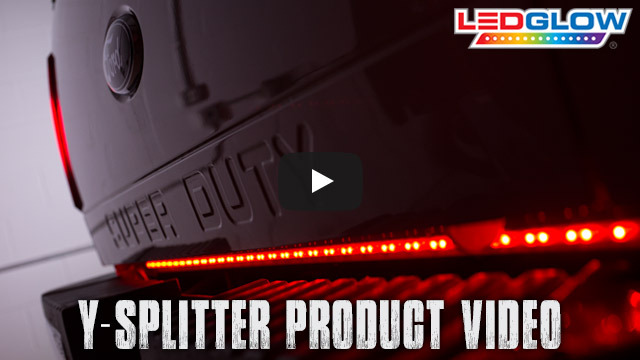 LEDGlow's Tailgate Light Bar Y-Splitter Harness allows you to easily connect your LEDGlow tailgate light bar as well as your trailer lights to your truck's factory flat 4 pin connector with plug and play connectivity. This harness features a length of 18", with 9" of wire for both tailgate light bar and trailer lights connections. LEDGlow includes a one year limited warranty and free lifetime technical support with each purchase. The installation from start to finish was 2-2.5 hours. I was working alone and accidentally mounted it too high the first time. On my ‘07 Ram, I had to mount the light bar just below the opening for the spare tire. I rested the bar on the tool to insure there would be no interference. The light bar isn’t visible until you’re approximately 30’ behind the truck. I was concerned about this but it’s actually a cool affect. All of the lights are super bright and really enhance the look of the vehicle. I’m impressed by how bright the reverse LED’s are. I often hook up trailers in the dark and I think these will be a huge help. I have ordered from you guys 3 or 4 times and i love every thing i have ordered the underbody lights look great on my truck and the brake light bar is great I wouldn’t put anything on my truck other than led glo you guys have great products and fast shipping. Love it, easy to use!